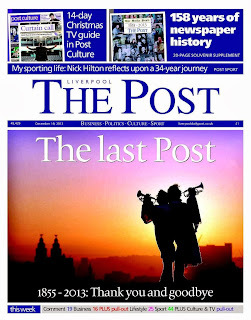 The Liverpool Post closes today after 158 years. Once a thriving morning title, it is the biggest 'name' in regional newspapers to be a victim of the challenges facing the industry. 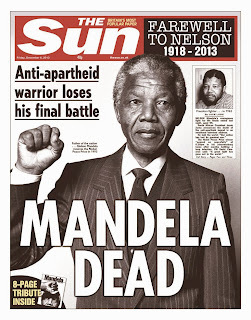 It went weekly four years ago and now it is no more. It is a sad, but understandable, decision. Producing two titles from the same centre in the digital age is no easy task. Bristol, Leeds, Newcastle, Cardiff, Dundee, Aberdeen, Plymouth, Norwich and Ipswich continue to do so … and long may they succeed. Two radically different titles, one for the county and one for the city seems to still work … for now. There are now more than 30 daily titles in the UK now selling under 20,000 - many losing sale by 10 per cent year on year. More conversions to weekly seems to be inevitable. 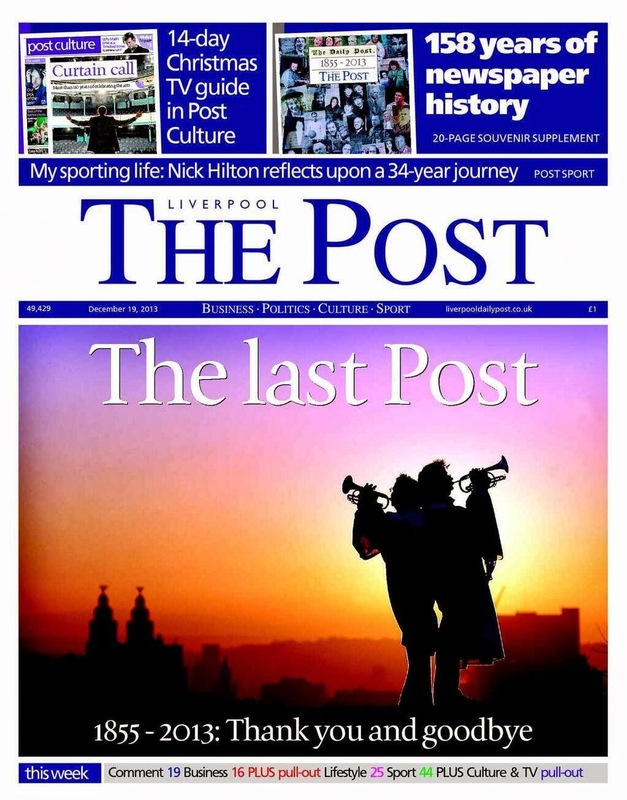 It is a sad day for Liverpool and for the newspaper industry. 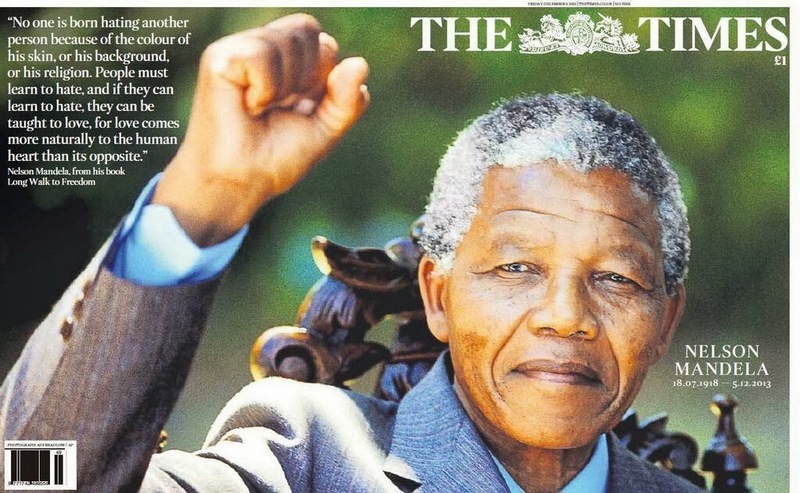 It is also a sad day for editor Mark Thomas and his staff who marked it with a classy and stunning front page and a poignant piece on the website. I wish them well. The most shocking page of the week goes to the Sunday Sport … and I don't mean the squeezed headline typography or the overuse of red washes. Great crosshead though - Smitten! How could you not read on!!? Congratulations to Paul Burton who has been appointed editor of The Herald in Plymouth. Paul was one of my Editorial Centre trainees in Hastings not that many years ago. He was always destined to be an editor, and a talented production journalist, so it was no surprise to see this rhyming headline in his paper today. Watch this space … there is bound to be more. 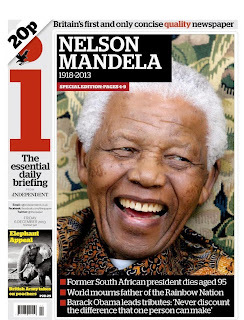 There is only one story on this morning's front pages. And with many papers already printed by the time Nelson Mandela's death was announced, it was all hands to the pump for a quick turnaround. 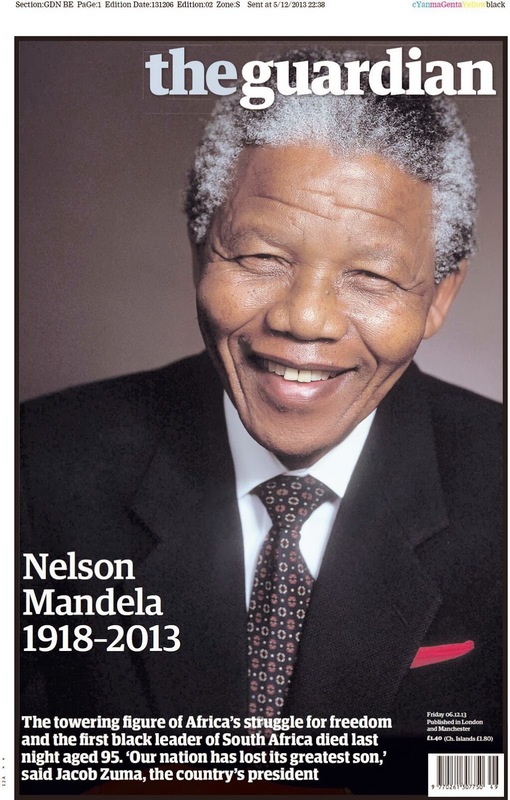 It's a simple page to put together of course - iconic image and poignant words - but highly effective nevertheless. 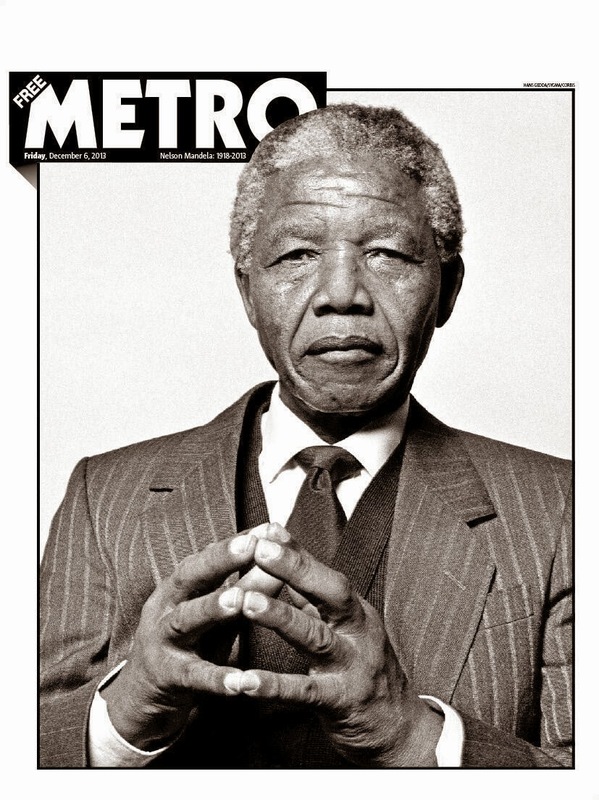 There are so many great images to choose from and so many strong fronts as a result. 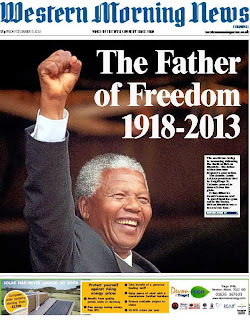 Let's start with The Daily Telegraph. 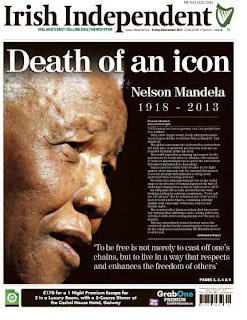 This is when a broadsheet comes into its own. 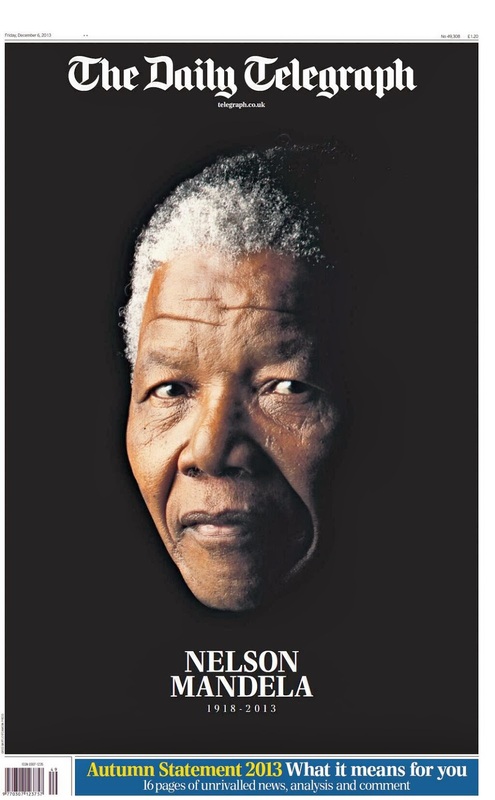 The eyes just sit above the fold and the whole page is like a portrait. Brilliant. The bar code (one of the broadsheet consequences) and the Autumn Statement blurb are unobtrusive enough. 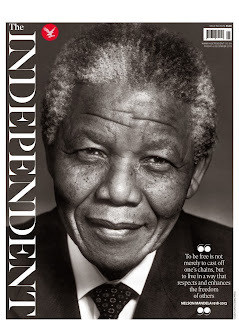 The Independent lets Mandela's face dominate almost the entire front and uses an understated quote at the bottom right. No headline required. 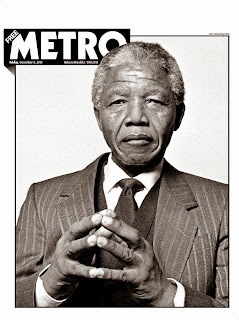 In Metro's case, no words at all are needed. 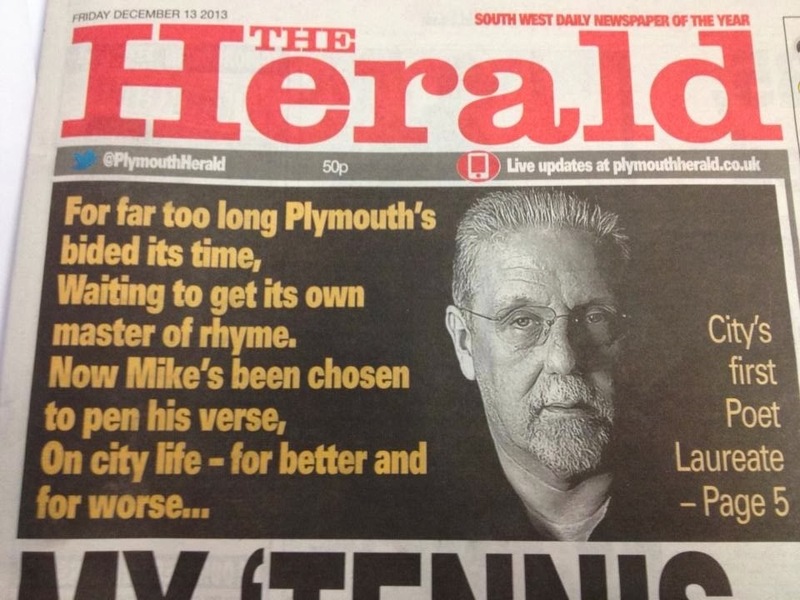 As editor Kenny Campbell tweeted 'What words are there?' 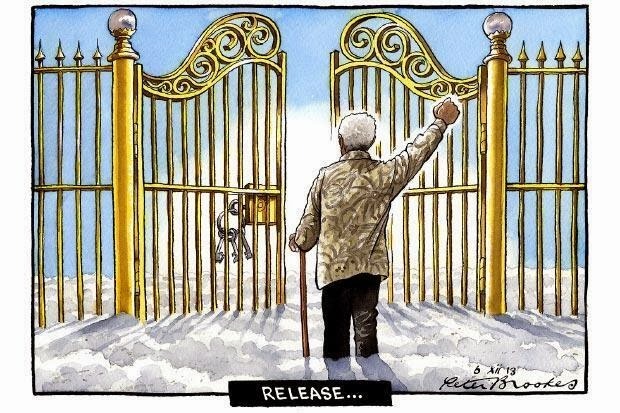 The man is the story and there he is ... in full dignity. 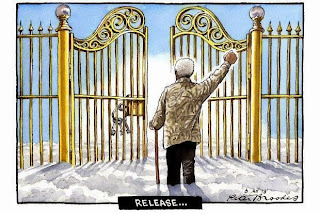 A stunning and sad image. 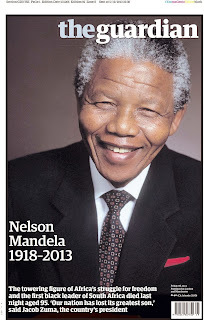 The Guardian uses the Berliner size to great effect. 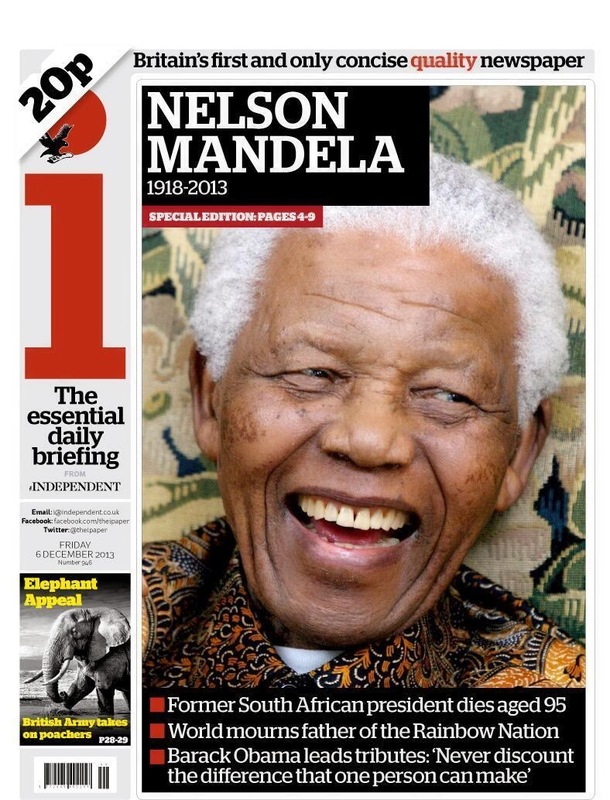 It clears the front, skies the image, reduces the headline, takes it under the fold and uses a quote from Jacob Zuma. Simple - and powerful. 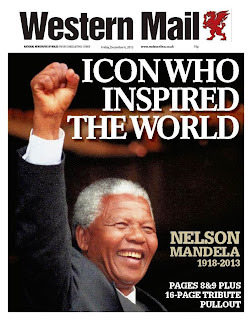 Hats off to the Western Morning News. 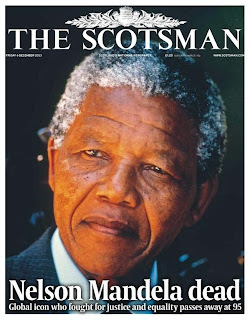 A fantastic smile and a positive image, along with a strong headline. The same image graces the Western Mail along with another strong headline. 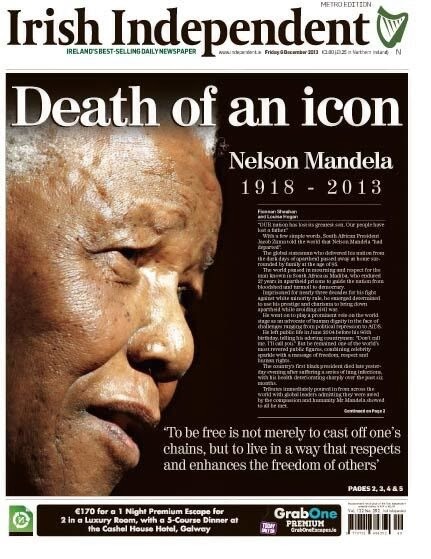 The paper also blurbs a 16-page pullout inside. The Northern Echo, perhaps appropriately, had its own Local Heroes awards last night and then had major press problems caused by the bad weather. 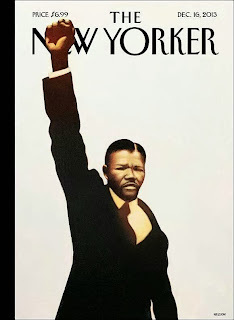 It still managed to produced this great cover. 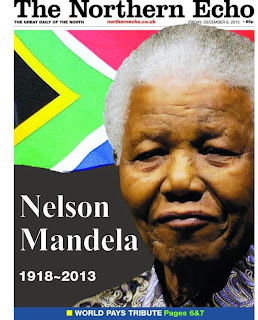 The only paper I've seen so far to use the Flag of the Republic. 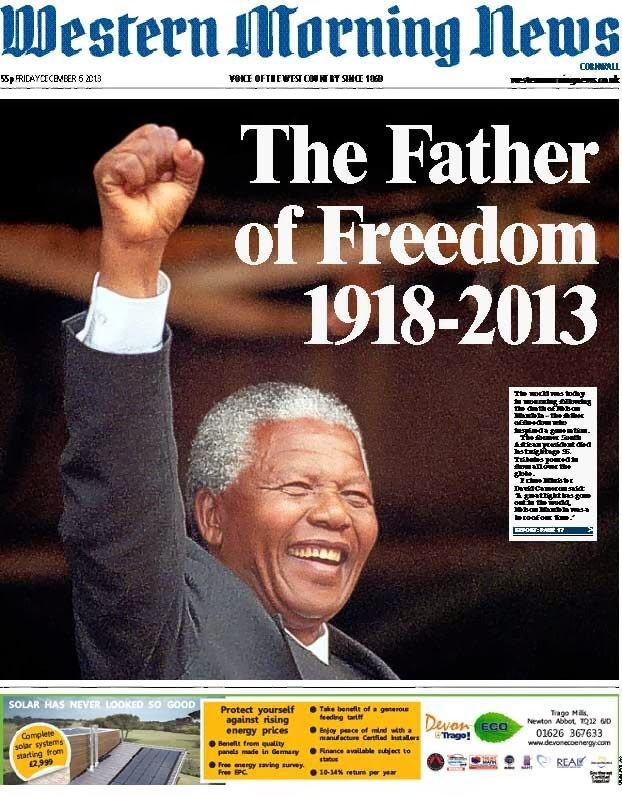 The Irish Independent uses an effective crop, bleeding off the page. 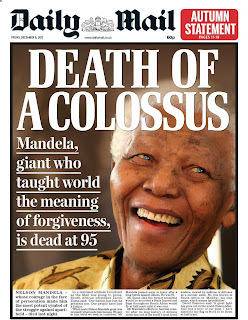 That smile features again on the Daily Mail - and if you are going to call him anything, colossus is just about right. It's a story of such magnitude that even the i clears its front. 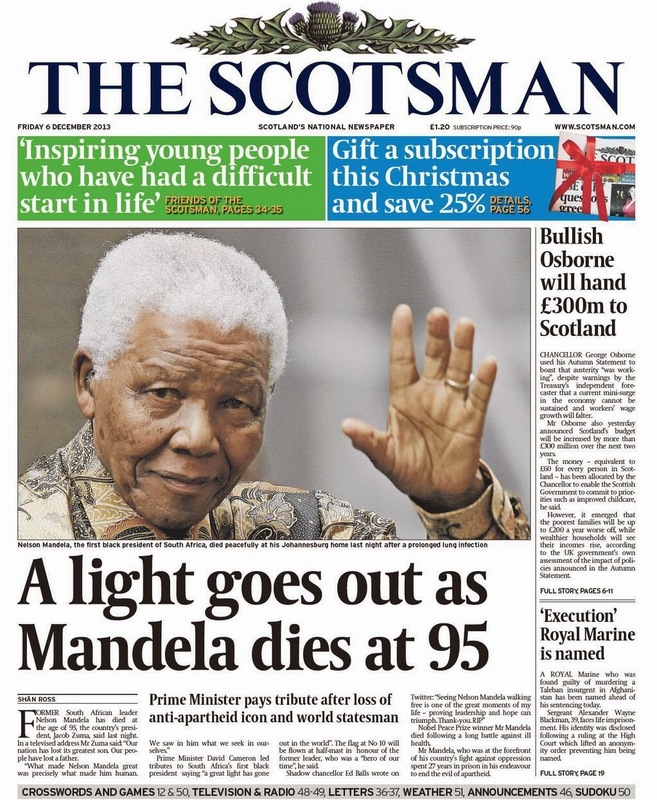 The Scotsman does a good rush job for its early edition. 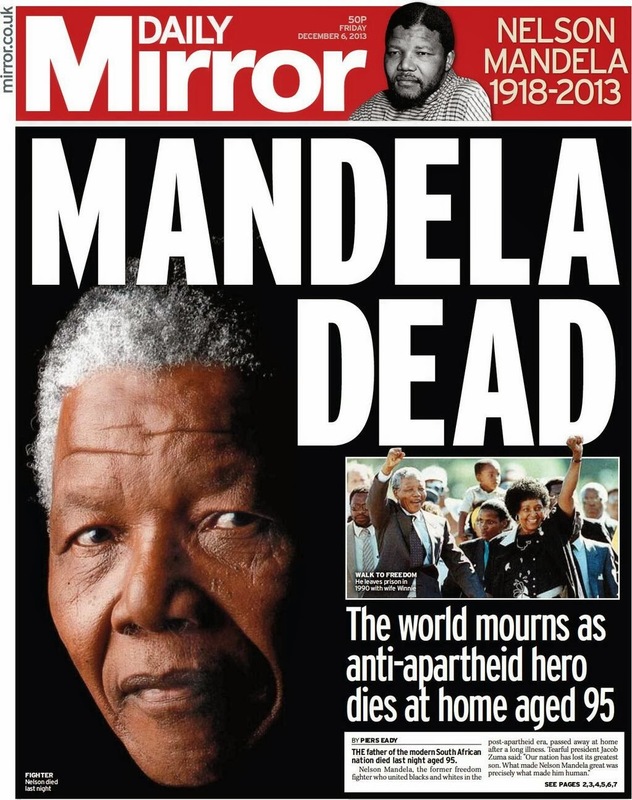 It doesn't wipe out its front but a strong image certainly dominates. 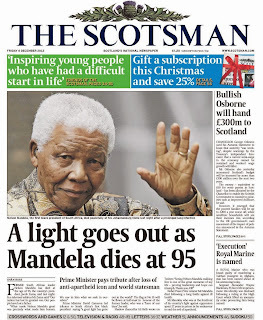 A light goes out it says, and few could argue with that. 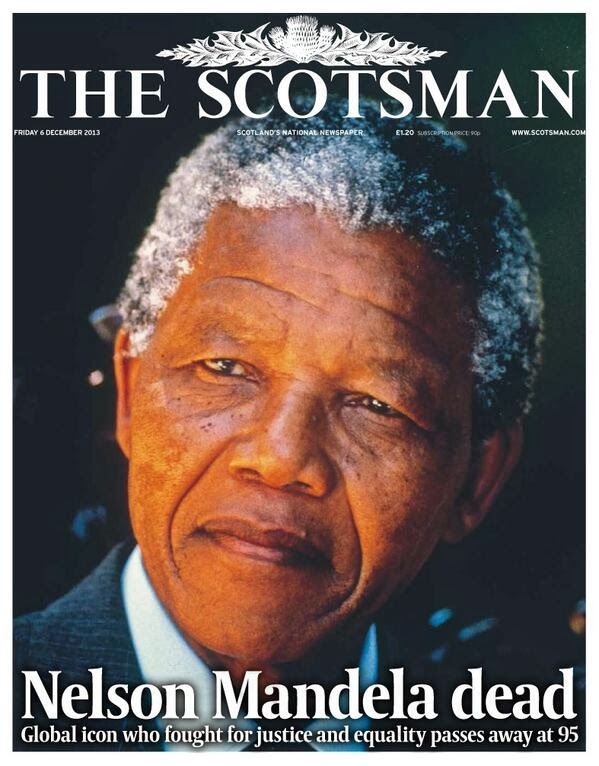 Later it clears the front for a dominant image, although it might have kept its first edition headline. 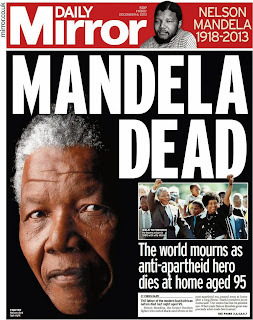 In the early editions the main redtops opt not to do a tribute and go for the same stark headline. It's not often they get a breaking story these days, so just decide to tell it as it is. 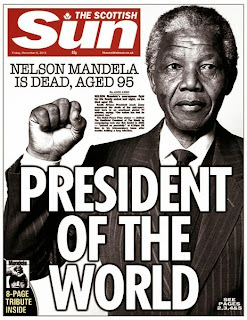 The Sun updates later for a more fitting President of the World. 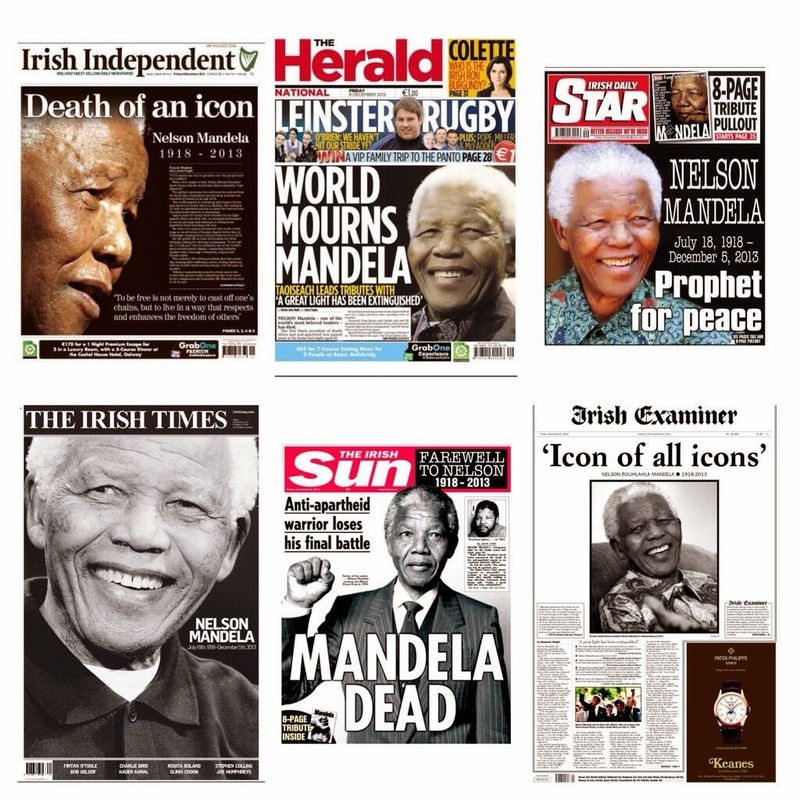 Here are some more of Ireland's front pages. 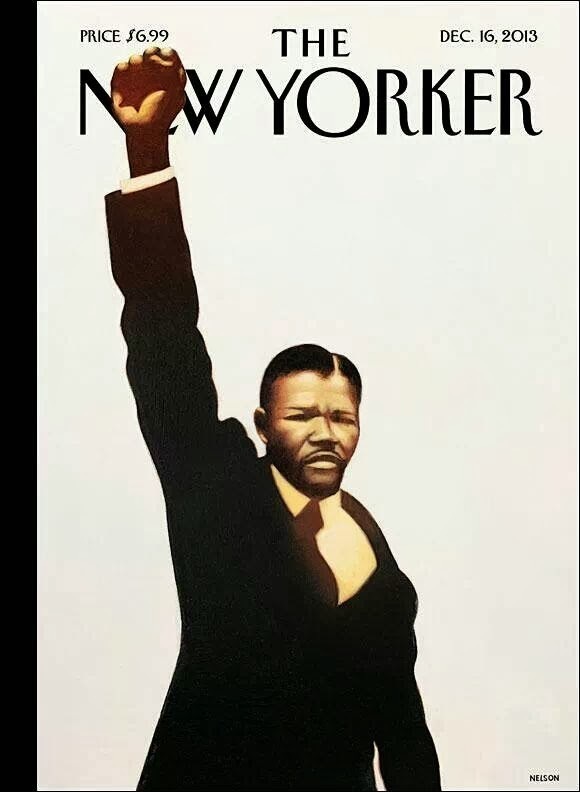 And finally, a sneak preview of next the edition of The New Yorker. 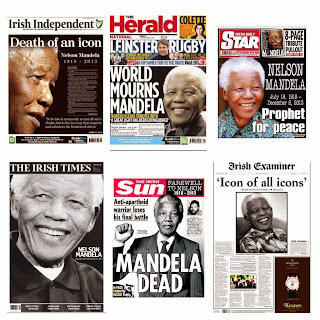 So, hardly surprisingly, all the newspapers are as one. Fitting tributes to the greatest statesman of our times. A memorable and special night.